Provision for automatic drainage is sometimes not included in the original system. It is possible to discharge liquid manually through a valve that has been cracked open. However, an open drain also continuously wastes air or gas. Periodically opening a valve by hand and leaving it until it blows freely will also drain a system. Frequently, however, an operator will delay or forget to close a valve, thereby wasting precious air or gas. Armstrong inverted bucket drain traps are designed for systems where heavy oil and dirt may be encountered. The enlarged bucket vent equipped with a scrub wire (BVSW) allows free flow through the bucket vent and discharge through the orifice in the top of the trap. Armstrong's cast iron, free-floating guided lever drain traps use the same bodies, caps, lever mechanisms, valves and seats of Armstrong inverted bucket steam traps. Elliptical floats and high leverage make it possible to open large orifices to provide adequate capacity for drain trap size and weight. The hemispherical valve, seat and leverage of the 1-LD, 2-LD, 3-LD and 6-LD cast iron traps are identical in design, materials and workmanship to those for saturated steam service up to 300 psig (21 bar), with the exception of the addition of a guidepost to ensure a positive, leak-tight valve closing under all conditions. Armstrong's stainless steel, free-floating guided lever drain traps use the same bodies, caps, lever mechanisms, valves and seats as Armstrong inverted bucket steam traps that have been proven in years of service. Elliptical floats and high leverage make it possible to open large orifices to provide adequate capacity for drain trap size and weight. The hemispherical valve, seat and leverage of the 11-LD, 22-LD and 13-LD stainless steel traps are identical in design, materials and workmanship to those for saturated steam service up to 570 psig (39 bar), with the exception of the addition of a guidepost to assure a positive, leak-tight valve closing under all conditions. All-stainless steel for horizontal installation. Armstrong's stainless steel, free-floating guided lever drain traps use the same bodies, caps, lever mechanisms, valves and seats as Armstrong inverted bucket steam traps. The hemispherical valve, seat and leverage of the 180-LD and 181-LD stainless steel traps are identical in design, materials and workmanship to those for saturated steam service up to 570 psig (39 bar), except that the 180 Series traps have a guidepost to ensure a positive leak-tight valve closing under all conditions. The 180 Series is designed for situations where mounting a drainer close to the floor is critical. A back vent connection is required. Armstrong's forged steel free-floating guided lever drain traps use the same bodies, caps, lever mechanisms, valves and seats as Armstrong inverted bucket steam traps that have been proved in years of service. Elliptical floats and high leverage make it possible to open large orifices to provide adequate capacity for drain trap size and weight. The hemispherical valve, seat and leverage of the 32-LD, 33-LD and 36-LD forged steel traps are identical in design, materials and workmanship to those for saturated steam service up to 1,000 psig (69 bar), with the exception of the addition of a guidepost to ensure a positive leak-tight valve closing under all conditions. Armstrong's duplex stainless steel free-floating guided lever drain trap use the same lever mechanisms, valves and seats of Armstrong inverted bucket steam traps. The hemispherical valve, seat and leverage of the 995LD-DSS duplex stainless steel trap are identical in design, materials and workmanship to those for saturated steam service up to 20 bar with the exception of the addition of a guidepost to assure a positive, leaktight valve closing under all conditions. Currently available in Europe, the Middle East, and Africa. Armstrong's line of fixed lever drain traps includes two basic models available in cast iron and forged steel. The floats are light enough to handle light liquids. No. 21 - A small, high-quality, economical drain trap for use on drainage jobs where dirt and oil are not encountered. It employs a single lever with a fixed pivot. No. 21-312 - Forged steel version of the No. 21, with larger float and higher leverage. Caution: Ball float drain traps are not recommended where heavy oil, sludge or considerable dirt are encountered in lines. Under these circumstances, use Armstrong inverted bucket BVSW traps. 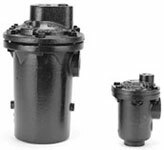 Armstrong's line of snap action drain traps includes two basic models available in cast iron and forged steel. The floats are light enough to handle light liquids. No. 71-A - Wide-open, tight-shut drain trap for use where fine dirt and grit may be present or where liquid load is light. A flat spring in the leverage system holds the valve closed until the trap body is nearly full of water. Then it snaps open, washing dirt through. When the trap body is nearly empty, the spring snaps the valve shut. No. 71-315 - Forged steel version of No. 71-A. The Armstrong high leverage series of liquid drain traps was developed especially for draining low-specific-gravity fluids from gases at high pressures. They use standard Armstrong forged steel bodies with very high leverage systems and spring assist. Note: Models 2313-HLS, 2316-HLS, 2413-HLS and 2415-HLS are also available with cast T-316 stainless steel body and all-stainless steel internals. It is essential that a safety factor of at least 2 be applied to the peak liquid load for sizing purposes. Do not use HLS drain traps on steam service. Sour Gas Service: Forged steel and stainless steel traps can be modified to resist hydrogen sulfide stress corrosion. These modifications involve annealing the float, which will reduce the maximum working pressure of the float to about half its normal value. Consult M&M Control Service for allowable working pressures. Armstrong free-floating lever dual gravity drain traps are identical to Armstrong's 2-LD, 3-LD, 6-LD, 32-LD, 33-LD, and 36-LD, except float weights are modified to make them suitable for draining water from a light liquid. If you wish to use them for draining any liquid with a specific gravity other than 1.00, call M&M Control at 1-800-876-0036 for assistance. Floats for dual gravity drain traps are weighted with quenching oil, which, in the unlikely possibility of float failure, may be dispersed through the system. Viscosity considerations for dual gravity traps: The operation of dual gravity traps depends upon a float that will sink in the light liquid and float in the heavy liquid. When the specific gravities of the two liquids are very close, the available operating forces are, therefore, also very small. Viscous fluids may impair the ability of the trap to respond to changing liquid levels. Armstrong ultra-capacity ball float drain traps are designed to meet exceptionally large capacity needs in draining water and other liquids from air or other gases under pressure. Liquid drainer with back vent for exceptionally high-capacity drainage of liquid from gas under pressure. The liquid drainer (LD) configuration was developed to meet very large capacity needs in draining water and other liquids from air or other gases under pressure. To prevent air or gas binding, the access port in the top of the body serves as a back vent connection to the equipment being drained.